It never ceases to touch and amaze Mort how his relationship with the Timber Ridge School over the past 17 years has impacted so many lives. This past Friday was no exception. The school’s “An Evening with Mort Künstler” was a delightful evening and a great success. 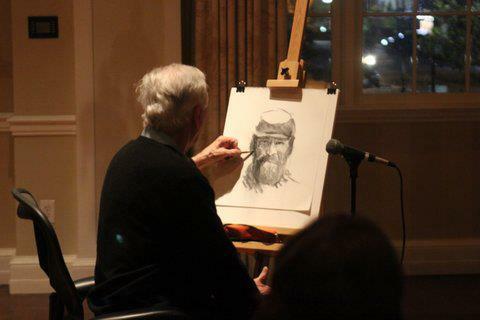 Over 70 attendees watched Mort create an original charcoal sketch of “Stonewall” Jackson. The sketch was auctioned to the highest bidder for $5,000.00. All proceeds from the evening went to the school. 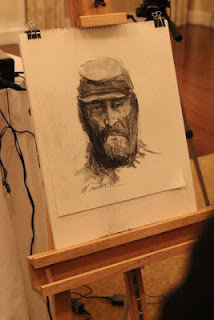 Mort sketching "Stonewall" Jackson with charcoal. Mort and Troy Newbraugh of the Timber Ridge School. Mort was not aware that Troy was bidding on the sketch for Mr. Wilbur Feltner. 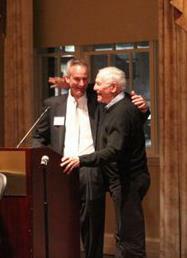 This photo is of Mort’s reaction to the news that his longtime friend was actually the high bidder.